A corrupt cop gets his comeuppance in this deranged and devilishly funny thrill ride. Not too many South Korean films make tidal waves across the Pacific, but even the casual movie goer knows one thing is obvious: South Korea knows genre. From Oldboy to I Saw the Devil to last year’s Snowpiercer, filmmakers like Park Chan-wook and Bong Joon-ho have been churning out one head-turner after another. All of which should make this year’s delightfully madcap thriller A Hard Day from second-timer Kim Seong-hun no surprise at all, especially when it dips into the manic, the absurd, and the violent. For Kim, the film is an exercise in tension—little happens that isn’t directly stoking the flames—and in truth, little more needs to happen. While it’s not the most inventive film in its genre by any means, A Hard Day is deliciously entertaining and nail bitingly executed. Lee Sun-kyun is Gun-soo, a hot tempered police detective having one hell of a bad day: his wife just filed for divorce, his mother just died, and his office was just raided by internal affairs. But all of those events amount to little compared to the headache he has in store. En route to his mother’s funeral, a slightly tipsy Gun-soo hits a pedestrian. In his blurred state of panic, the morally compromised Gun-soo stuffs the body into the trunk and heads off to his mother’s funeral—meaning he now has to bury two bodies. From there, Gun-soo must seemingly dig himself through the Earth’s core to get out of the hole he’s in. After disposing of the body and covering the damage to his car, Gun-soo gets the first of many threatening calls by Park Chang-min (Cho Jin-woong), who witnessed the hit and run. Now the mysterious and ubiquitous Park wants the body back, and he’ll do anything to make Gun-soo get it for him. What follows is deranged, darkly hilarious, and hard to believe. Nevertheless, the film works shockingly well, even as it dips into the generic and rings one genre bell after another. The resulting film amounts to a devilish ride that flies by thanks to its accelerated pace. For the most part, A Hard Day belongs to Lee. A good portion of the film’s 111 minutes focus squarely on Gun-soo’s face, watching him react to the insanity around him. Lee is maliciously excellent at the start as the malevolent, omnipotent detective, abusing his power with straight-faced sarcasm. But once things go sour, Lee’s hysteric, one-note Gun-soo is far less fun to watch. He screams and shouts into his phone, by turns terrified and angry, pushing forward the plot, while leaving his early magnetism and wit behind. The true gem of the film is Cho Jin-woong. His scenery-chewing Park Chang-min steals the screen every time he’s on it, taking pleasure in making fools of those around him and never missing a chance to mess with Gun-soo. As the film switches gears from plot device to MacGuffin to set piece—a structure designed only to throw more and more obstacles in Gun-soo’s path—it manages to never lose its footing thanks to the crisp writing; the dialogue is surprisingly funny in the most unassuming ways, preferring subtle humour to levitate the despicable behavior often at hand. To boot, Kim Tae-sung’s cinematography makes everything look gorgeous: Seoul is lensed with a dynamic flare, the chase scenes are vibrant, and the cemetery in the rolling hills outside the city looks somber and pastoral. As a pure thriller, A Hard Day works. All the beats are hit, the editing is kinetic, and composer Mok Young-jin’s pulsing score rises from one fever pitch to the next, helping the action steadily rise toward a chaotic climax. Kim’s direction from his own script is, for the most part, sharp, energetic, and full of promise for the future. His interests are clear, and by taking the film for what it is—instead of what it could be—it’s easy to get caught up in A Hard Day’s thrills. A Hard Day opens in select theaters on Friday, July 17th, and will expand to Toronto and other cities on Friday, July 24th. 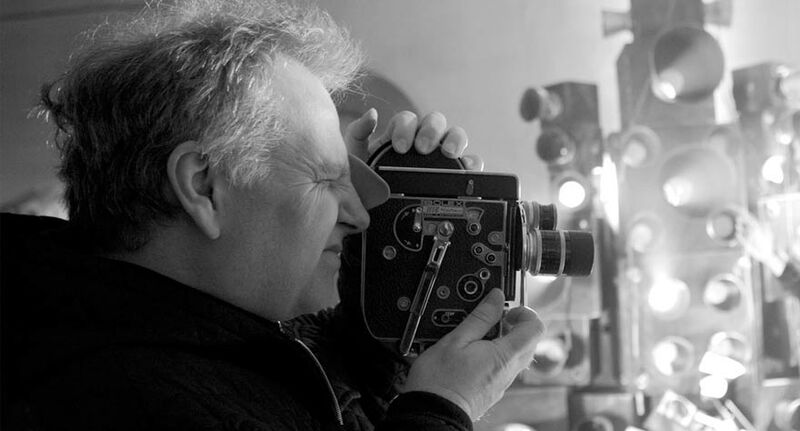 Guy Maddin on Sirk, Technicolor, and Film's "Super-Democratization"
From the looks of it, Guy Maddin's been having a good year. Back in January, his 2007 “docu-fantasia” My Winnipeg received a DVD and Blu-Ray release on The Criterion Collection.